Most bases come with slide out drawers. You can either knock out spent coffee pucks or use as an accessory storage. Knockboxes are a better alternative to emptying your portafilter over a dirty garbage can. Whether you need an espresso, cappuccino, or latte cup, I’m sure you will find one that you will want. Here you will find all tools that will need for your precise dosing measurements. The weighing scales will help measure out ground coffee to a 0.1 of a gram. Thermometers can help with frothing milk. Timers can help time your shot better. One of the most important parts in espresso making. 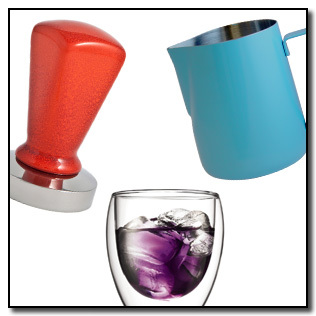 We carry customizable tampers from Concept Art. Most size bases we have available, including some not so common. Everything else you may need or didn’t know could use including coffee storage containers, dosing tools, milk frothing aids, scoops, and spoons.